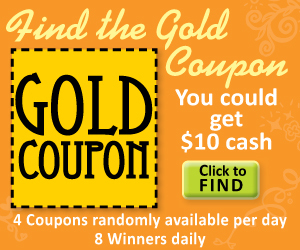 For 9 days, beginning today CommonKindness is running a Find The Gold Coupon Contest! All you have to do is locate the special Golden Coupon similar to the one pictured above. There will be 4 Golden Coupons posted at random times throughout the day (each of these 4 coupons will only be available to print for 15 minutes!) so you’ll want to head here and check the site often. * Look for the unique Golden Coupon Code embedded in the terms of the coupon (you will need to print the coupon in order to view the terms). * Send an email to the email address info@commonkindness.com and be sure to write the unique Golden Coupon Code in the Subject Line of the email. * The first 2 email submissions received for each Golden Coupon will be awarded a $10 cash prize (there will be a total of 8 winners daily!). Fine Print: Limit one $10 cash check per person. If individual has already been selected to receive $10 cash, the next consecutive email submission will then be selected. Each of the 8 winners will be notified via email at the end of each day. www.ClipperGirlSavingSpot.com went beyond the savings and incorporated a message of kindness for her audience. Thank you Clipper Girl for spreading kindness and helping your audience Save Money & Help Others. Nature’s Gate, creator of personal care products formulated from botanical remedies, is celebrating World Water Day—March 22, 2013—with free printable grocery coupons that reward shoppers and support charities. Each CommonKindness.com coupon saves the shopper $1.50 on their Nature’s Gate purchase and generates funds for the nonprofit organization of the shopper’s choice. CommonKindness donates 20 percent of its revenues to the nonprofit organizations shoppers choose when they go to http://www.CommonKindness.com and start downloading coupons. In honor of World Water Day, Nature’s Gate suggests shoppers consider selecting WaterAid as their designated nonprofit to support the organization’s mission to help communities in Asia, Africa and Central America obtain long-term access to safe, clean water. The United Nations established World Water Day as a means of focusing attention on the importance of safe water, and to advocate for the sustainable management of freshwater resources. WaterAid uses this day to raise awareness that 11 percent of the world’s population does not have safe water to drink, and that this coupled with poor sanitation, results in 2,000 children dying every day. Rainwater has always held special significance to Nature’s Gate. Over 40 years ago, founders Leo and Vladimir blended rainwater and natural herbs from their herb shop to create the very first Herbal Rainwater Shampoo. Shortly thereafter, they began giving it away to their friends and herb shop customers. It became a phenomenon all along Venice Beach, California. Nature’s Gate continues to be inspired by its surroundings, creating formulas that combine proven botanical, herbal, and floral treatments with modern ingredients and techniques. Using all-natural herbs and pH-balanced formulas, each product is carefully formulated to deliver the many benefits of each unique botanical blend. All Nature’s Gate products reflect ongoing efforts to preserve the earth’s natural resources and develop sustainable sources of clean water. Since its founding over 40 years ago, Nature’s Gate has been pairing nature with science to create high quality, safe, sustainable, and affordable personal care product s. Nature’s Gate products are made with pure, sustainably-harvested herbs, fruits, and essential oils (no animal-derived ingredients) that enhance the overall health and well-being of people and the planet. Save $5 on the purchase of a Fresh Food Chopper and Steamer and raise funds for your favorite nonprofit organizations using new printable coupons from www.CommonKindness.com. The Munchkin Fresh Food Chopper and Steamer makes preparing baby food at home easy and painless. This two-in-one tool allows you to chop food quickly with its stainless steel cutting blade, and then steam it in the microwave. It comes equipped with a cleaning tool and dishwasher-safe parts, and it is BPA free. The Munchkin Fresh Food Chopper and Steamer helps you to take your baby’s food from “boring” to “bon appétit. The possibilities for feeding your baby do not stop at what you find pre-prepared on supermarket shelves. And since you control what you are feeding your baby, you know the ingredients are fresh and safe. CommonKindness.com is the free grocery coupon website that empowers you to generate funds for your favorite nonprofit organization every time you make a purchase using a CommonKindness coupon. The company gives a whopping 20 percent of its revenues to nonprofits. The best part is that you get to choose which charities receive donations generated by your CommonKindness coupon purchases. Many of us are lucky to have the support of family and friends when we make mistakes or disaster strikes. They encourage us, help us take the next step, remind us of our goals. For more than 3,000 people in Alameda and Contra Costa Counties, Rubicon is that support. Since 1973, Rubicon has provided employment, housing, mental health, and other services to low-income residents of some of the hardest hit communities across the East Bay. One Rubicon client, Dorothy, became homeless after depression and drug addiction got the better of her. Living under a bridge, alienated from her children, and scared for her safety every night, Dorothy lived through dark times. She tried to end her own life. Someone suggested she come to Rubicon. Dorothy was determined to make her life whole again. She accessed the services she needed at Rubicon–customized to meet her challenges. Her depression combined with physical problems like diabetes and addiction kept her from being able to work. Rubicon’s legal support staff helped Dorothy access Social Security benefits. Rubicon’s Bridges to Home program found Dorothy a place to live in a peaceful neighborhood in Pinole–away from the violence and temptation of her Richmond life. One-on-one counseling with a caring therapist, group therapy, and home visits helped Dorothy learn how to cope with difficult feelings and overcome drug addiction. Rubicon staff gives Dorothy rides to doctor’s appointment and to Narcotics Anonymous meetings. Rubicon aims to treat clients with respect, and as whole people. To help people who have been struggling with mental illness most of their lives define what health and happiness is for them – not what we say it is. And it works. We decreased hospitalization rates for people with serious mental illness by 54% last year. Dorothy regained her family members’ trust and spends time with her children and grandchildren. Her son is proud of her and picks her up for dinner each week. Without Rubicon, Dorothy says she would be homeless, not taking her medication, drinking, using drugs, and ending up in the hospital like she used to.